This bike is for sale. I made it myself. It has 3 wheels. They are blue. It took me 2 hours to build. The price is $4. I will mail it to you. Cole, can I buy one for Mia for Xmas?? But please don’t tell her..our secret. I’m going to see your Dad next weekend perhaps he can bring it with him and I will give him the money to give to you? Deal? It’s a deal! Thank you. I love you. Hi Cole, I would like to buy your bike. I would like to give it to a 3 year old friend of mine for her birthday. After you package it up and pay for the postage, let me know the total and i will send you the money. I believe your Dad or Mom will vouch for me. Thank you so much. I will send it to you. Thanks, Cole. Please remember to send me the cost of the postage, and I’ll include that with the payment. Hi Cole. Want to let you know unfortunately I haven’t received the parcel yet. I think two weeks should be lots of time for it to reach here, so wanted to check and see approximately when you mailed it? Thanks very much! Sorry I haven’t sent it yet. Hi Cole – my misunderstanding. That’s perfect – I’m in no rush. Didn’t want you to think I’d received it and wasn’t sending you the money. I can stop worrying now…(LOL). Hi Cole – I received the bike, too, and mailed you a cheque on Wed. Dec 13. Please let me know when you get it OK? The bike is really colourful. I know Zoe will love it, but she is away in Australia for six weeks. It will be a nice surprise when she returns. Have a great Christmas – enjoy your travels. Hi Cole, sorry about the delay but the cheque is in the mail. I also wrote to you that I would like to order another one for Uncle Roy’s birthday. Is this possible? Do you have enough parts? 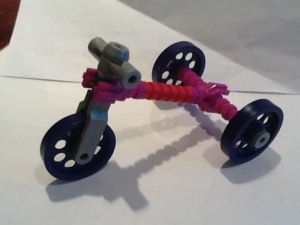 Hi Cole – just want to follow-up with you to let you know how much Zoe enjoyed the bike you made! She was delighted. I gave it to her disassembled, and after a few minutes, she had it figured out – not bad for a 3 year old. We just got to see her two weekends ago, even though she was back from Australia early January. She has a new horse, Miss Brooks, and we had fun watching her ride a draft horse named Samson. Maybe your Mom or Dad could show you the pictures I posted of her on Facebook? We really had a fun day on the farm. Take care & thanks again – I know Zoe will get hours of fun from the bike you made.